When it comes to Tech Startups Ecosystems in the U.S. outside of Silicon Valley, New York is undisputedly the “other” pole of attention, but suddenly, there is increased attention on Boston. Can Boston become the third pole? What’s the reality? So, let’s review what is happening on the ground in Boston, then follow with an analysis of the last 100 venture funding deals in both cities, utilizing Mattermark data (published with permission). First, the Experiment Fund is a new $10 million fund that has partnered with Harvard University and operates along its School of Engineering and Applied Sciences to scout potential investments with students, on campus. Then, the Dorm Room fund, managed by First Round Capital, is now expanding into Boston, its a fourth city. Also, Polaris Venture Partners is moving its headquarters into the Innovation District, and it was recently reported that Mark Cuban has made 6 investments in Boston-area startups. 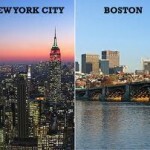 Barb Darrow at GigaOm names 8 ways Boston can nurture – and keep – more startups. One of them is to “raise the fun quotient”. Jeff Bussgang of Flybridge Capital Partners, part VC, part professor at Harvard has a post with a Slideshare, What Makes the Boston Startup Scene Special? Among the many reasons, it has 74 universities and colleges with 265,000 students. This is probably Boston’s most important advantage, given that students are the next entrepreneurs, and Universities are possibly the next VCs, according to Fred Wilson. Rob Go of Nextview Ventures has The Hitchhiker’s Guide to the Boston Tech Community (Fall 2013 Edition), a very comprehensive listing of the who’s who including Meetups, University resources, VCs, co-working spaces, accelerators, upcoming startups and thought leaders. Back in the 80’s, Boston was the undisputed second pole for high-tech, especially around the famed Route 128 corridor. I used to work for Hewlett-Packard’s Medical Products Group during that time, and would travel there almost monthly. I vividly remember the names of many tech companies that peppered Route128 when I made the trek to I-93 from Waltham on the way to Andover: Nixdorff, Data General, Digital Equipment, Honeywell, Wang, Apollo, EMC, to name a few. These were the mini-computer hey days. Fast forward to 2013, and Boston is in a renewal mode. To get a reality check, I analyzed the Mattermark data on the last 100 VC deals in Boston and New York (as of September 10, 2013) to understand their make-up, and compared how the two cities relate to one another. But I backed out medical devices, biotech, clean tech and pharma companies in order to keep it to “Core Info Tech” companies that will be the subject of this analysis. 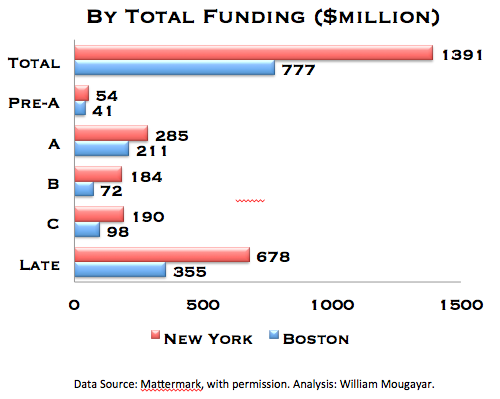 Total funding levels for the last 100 deals were higher in Boston, at $2.47 Billion vs. $1.56 Billion for New York. But that’s caused by the fact that Boston had 30 life sciences, biotech or cleantech companies who typically command much higher investments, whereas New York only had 10 in that same segment. By stripping that segment out, we were left with 70 companies in Boston that raised a total of $777 Million, vs. 90 companies in New York that raised close to $1.4 Billion. Therefore, the overall average per company tilts in the favor of New York, with $15.4 Million vs. $11.1 Million for Boston companies. But when looking at the various funding stages, the differences were somewhat narrower. In the Pre-A segment, Boston had 35 deals or 50% of the 70 that were analyzed, vs. 42 deals or 47% for New York. 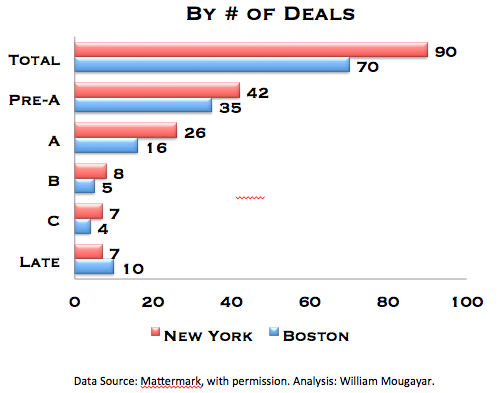 In the A, B and C rounds, Boston had 25 deals (36%) vs. 41 deals in New York (45%). In late stage, we found 10 deals in Boston (14%) vs. 7 in New York (8%). It’s interesting to note that I had to go back 76 days to find the 100 deals in Boston (June 24-Sept 10), whereas it took only 58 days to find New York’s last 100 deals (July 12-Sept 10). This means the velocity of investment is higher in New York. For each stage category, here is the list of the top deals, including all the VC firms that participated from the beginning, for each company. Late Fab Online design store $336 Million $5 Million Baroda Ventures, First Round Capital, Zelkova Ventures, SoftTech VC, SV Angel, Menlo Ventures, Thrive Capital, Pinnacle Ventures, DoCoMo Capital, Mayfield Fund, Atomico, Andreessen Horowitz, Pinnacle Ventures, RTP Ventures, SingTel Innov8, ITOCHU Corporation and angels. There you have it. 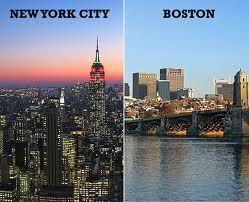 Boston vs. New York. If you compare sheer volume and density, New York is ahead, outside of Cleantech, Biotech, Pharma and Medical Devices. Boston is slightly leading in the distribution across early stages, and in the late stage category. The velocity and density of deals is higher in New York, but Boston could show new momentum because of the increased attention and activity levels. For Boston, the battle may be an internal one, because the dollars are still titled towards Medical Devices, Pharmaceutical, Biotech and Clean Tech. Boston needs to grow its share outside of these traditional sectors, but regardless, Boston is definitely in a solid third place and will remain that way for the foreseeable future.